Way back in 2008, four buildings along Louisville’s historic West Main Street were demolished to make way for Museum Plaza, what was then hoped to be the state’s tallest skyscraper and a savior of downtown development. That project failed, but left physical and emotional scars in its wake. Among those, the empty hole along one of Louisville’s most prized streets. Now, a coalition has transformed the expanse of asphalt into what will become ReSurfaced, a vibrant pop-up plaza and beer garden. 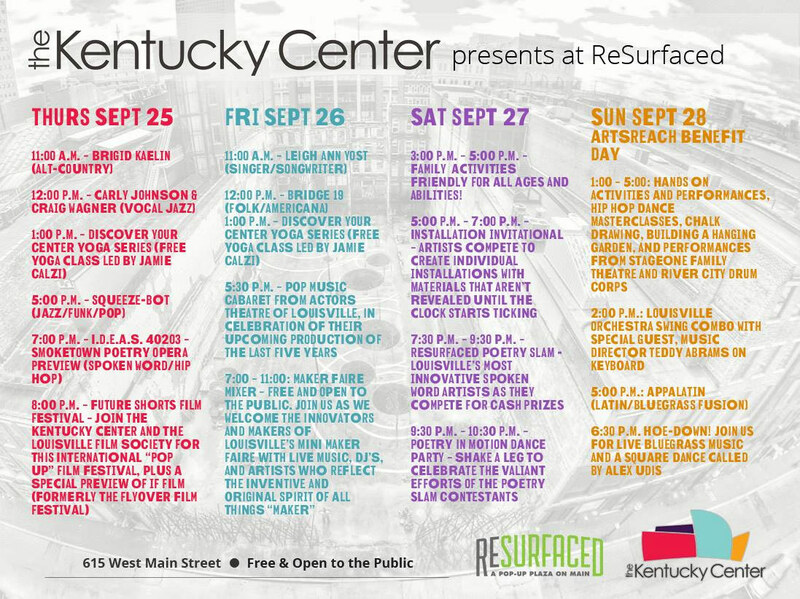 ReSurfaced runs from September 19 through October 25 and is jam-packed with events and programming that are sure to make every minute of it exciting (including our own launch party on October 17). And the future of this little plaza might just hold the secret for the future of Louisville urbanism. Pat Smith, one of the organizers and a board member of City Collaborative, told Broken Sidewalk what the pop-up space means for Louisville, how it will change public space in the city, and what we can expect when it officially opens tomorrow, Friday, September 19. Broken Sidewalk: How did the idea for ReSurfaced come about in the first place and how did you choose this specific site on West Main Street? Pat Smith: We really wanted to do something with these large expanses of asphalt that are both posing problems for the way we interact within the built environment and for public health. We drew some inspiration from Angie Schmitt’s work with StreetsBlog looking at Parking Craters. The near core area around Downtown Louisville has the largest concentration of open lots. We asked ourselves, “How could we use tactical urbanism to address the issue of having way too many surface parking lots?” Out of that the idea ReSurfaced was born. We wanted to focus in on a place that could captivate the imagination of Louisvillians about how we deal with these lots—that’s how we ended up with the Main Street site. The Parking Authority of River City (PARC) owns the space now. It has those beautiful historic ruins in the facades. 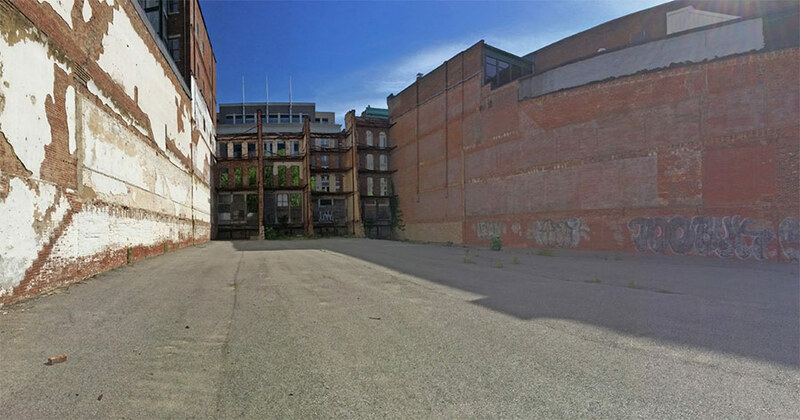 We thought this would be a really great space to launch this project, and we thought it would be a really great space to have a demonstration of how people can quickly jump in and “previtalize” one of these lots, while making a space for art, technology, and community building. 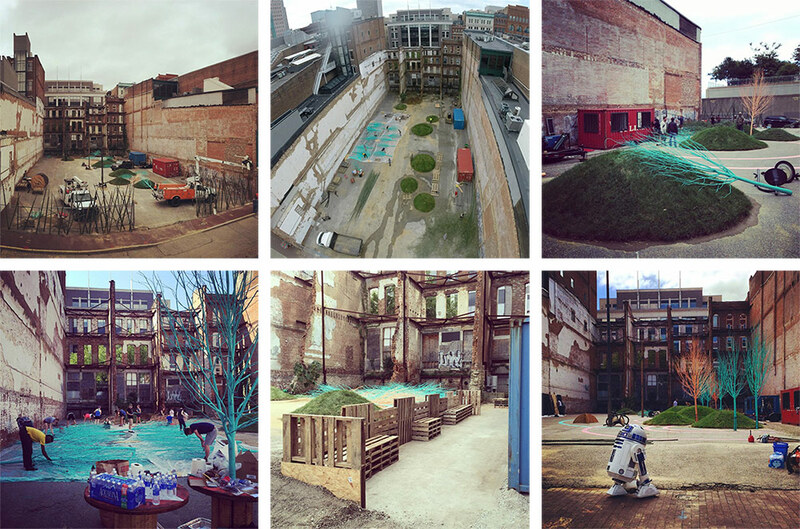 You’ve also mentioned you were inspired by a similar project for a pop-up beer garden in Memphis. What did they do right and how are you building on that? 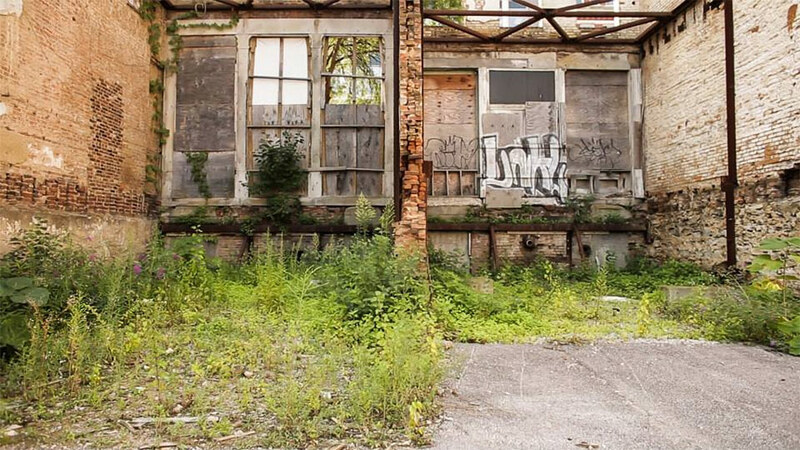 There was a really great connection Patrick Piuma had with Tommy Pacello of the Bloomberg Mayors Innovation Team in Memphis, where the team worked with a local business owner to take a building that had been vacant for a long time but in an active neighborhood in a vibrant part of Memphis, and make it something more. 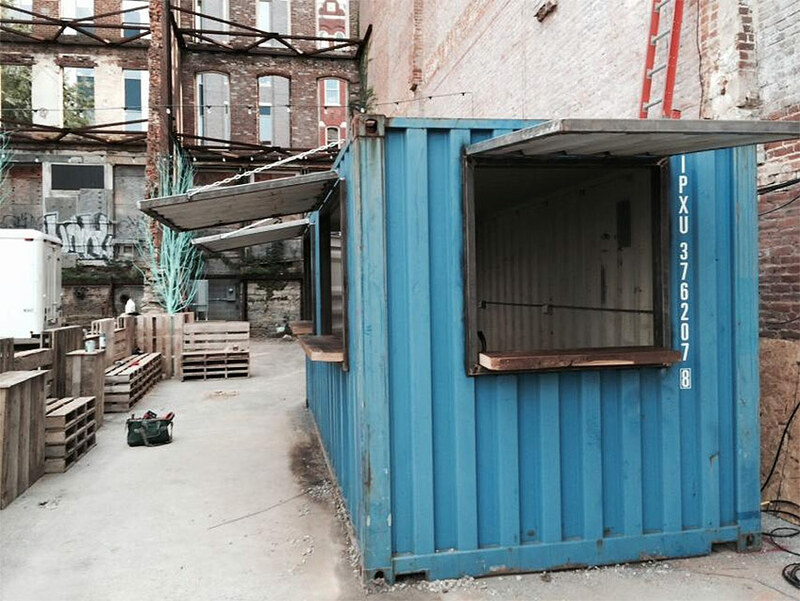 It was an easy sell to convince people to make this into a pop-up beer garden. Where ReSurfaced deviates pretty dramatically and becomes its own project is that it takes a completely blank slate—we don’t have a building, we only have this area that’s an empty lot—and creates something entirely new out of it. Another challenge is that, beyond some tourists walking back and forth between museums and hotels, there’s not a lot of activity down there on this area of West Main Street. We were asking what we could do to really activate this space. Part of what made Memphis Untapped so big is that they were in the heart of a vibrant neighborhood and part of a month-long Memphis festival. We don’t have that same situation here, but we’re hoping to create a lot of interest—and we’re seeing a lot of interest from people in Louisville already. What are some ways you plan on activating the space? We brought James Gunnoe and Heather Burks from Eiderdown and Nachbar in to think about what we could do with the ReSurfaced space. We wanted to bring an element of technology into this as well, so we’re bringing the Blue Sky Maker Mobile into ReSurfaced with laser cutters and 3d printers. We’ll have the local chapter of the Interaction Design Association who will be doing some interesting stuff with interactive gaming with lasers on the wall. We have this huge slate of programming. Some of the coolest bands in Louisville will be performing on Saturdays. We’ll have some of the biggest, preeminent arts organizations, including the ballet, the opera, Kentucky Shakespeare coming in and breathing life into this space. On Thursdays, we’ll be having really interesting talks and forums, among those an extension of Louisville Pecha Kucha Night that’s focused on the pop-up and grassroots urbanism issues in Louisville. And there’s another tech tie in: Forest Giant will be presenting one of their new products which is an application that allows people to refine pitches on their cell phone and helps people collaborate through the project they’re working on. There will be a pitch contest during IdeaFestival. We’ll have a fantastic talk from an author who has a new book about the history of beer in Louisville, and how that’s been so important to the development of the city, not only the culture but also the urban form. Tying in with that, the Kentucky Museum of Art and Craft, just a few doors down on Main Street, has an exhibit about how beverages create community. There’s also been a special beer brewed up just for this event by Against the Grain. It’s a sort of special blend that’s a throwback to this indigenous Kentucky beer called Kentucky Common that was started in Louisville. It’s a special kind of beer with a special brewing process. We’ll have that as the official beer of ReSurfaced. And you’re working with a lot of nonprofits through ReSurfaced as well? 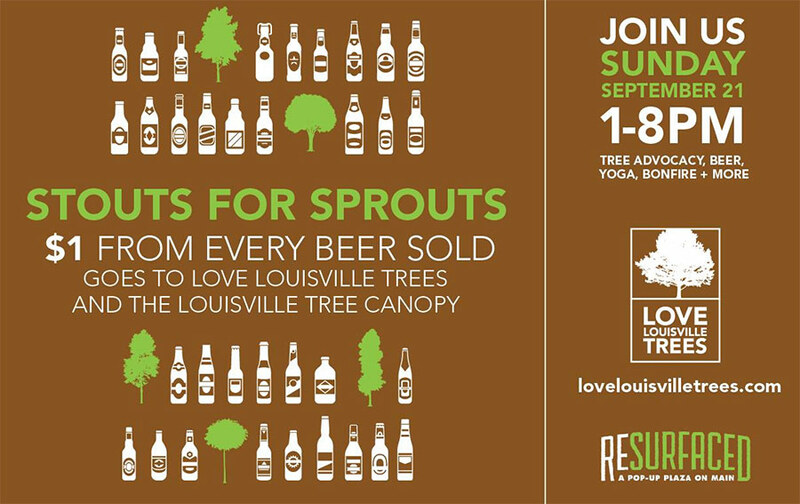 We’ve got Louisville Grows on the first Sunday. We’re going to support their Love Louisville Trees program, which is trying to get more trees planted in Louisville because we desperately need them. The following week, we’re working with the Kentucky Center and some of the revenue will be shifted to ArtsReach, which goes into community centers and schools to bring arts programming to young people. The week after that, we’ll be working with the fantastic Squallis Puppeteers, followed by Bicycling for Louisville. The final weekend we’ll work with the Kentucky Opera and have programming from them all day long. How did you come up with the ReSurfaced design and what were the influences for creating spaces out of this larger vacant lot? A big part of tactical urbanism—and the ethos of what City Collaborative hopes to do with these pop-up projects—is how we can move quickly and make a big impact. So a part of the design of the space has been adapting to what we can pull off in a community-driven effort, not necessarily with the largest investments. We’ve troubleshot things in the last six weeks as this thing has come together rapidly. For instance, we only got the permitting and approvals and agreements set up in the last month and a half. We’ve luckily had fantastic design partners come in and help us work with a quickly changing landscape. Two of those players have been Henry McGalliard Landscape Architects and Core Design. They’ve designed a really incredible landscape installation that has driven the way the space is laid out. Another challenge was ensuring that the workers could get in and out while we’re building this thing on such a tight timeline. And to make sure we can get food trucks into the space. We’ve figured it out along the way and we’ve really ended up with a space that captivates the imagination. It was incredible at the last community build last Saturday afternoon to see literally hundreds of people either up on the plaza at the Muhammad Ali Center or just walking through that were blown away. They would come in like this was a sort of exhibit, wanting to know what it was. People see this thing, and they’re immediately drawn in and they want to know what’s going on. What does it mean for the project that it is built by the community? Does that change the way it might be viewed or perceived? The fact that we have such a huge level of support from a couple hundred fantastic volunteers and from a host of local businesses is fantastic. People know this is owned by the people—this isn’t controlled by a single player, it’s really been shaped by all the players who have been involved. That has created a feeling that this is something completely different and has strong grassroots element. Throughout this entire process of working with all of these partners and the community, has there been anything unexpected that has come up? What’s really been unexpected is just the sheer level of interest and the desire to be involved—people have been pounding down the doors. I’ve never has this many emails before asking, “how can we get involved?” For a group like Kentucky Shakespeare to want to come in—that’s huge. It’s not easy to pull together a reading of Macbeth with some of the top Shakespearean actors in the state coming down on October 25th to do this. Just having people get what this means for the city is great. We look around our city every day and we see these giant asphalt slabs, and we’re tired of it. 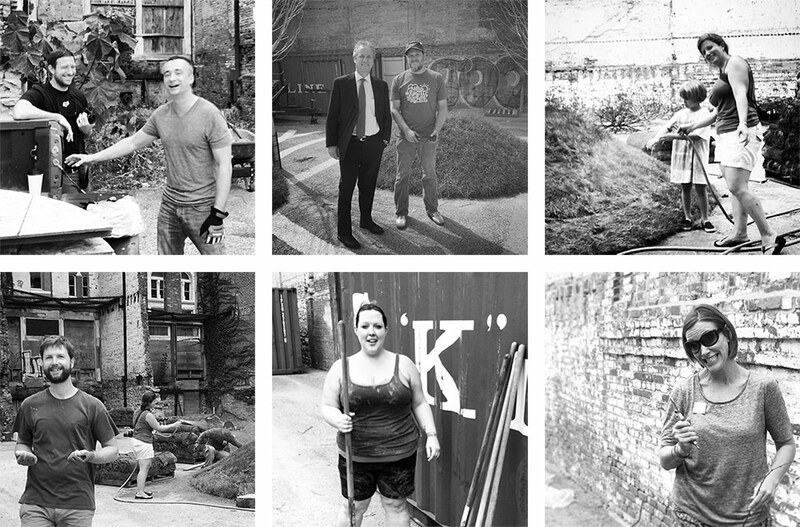 We want to step up and make this space something that reflects the values of the city. We have a lot more power and control over these spaces than we think we do. This isn’t something we just have to sit and look at. It should be looked at from a very constructive perspective. City Collaborative wants to be an organization that helps people figure out what to do with these types of spaces in their own neighborhoods. What’s next for City Collaborative? The idea overall is that this is just the beginning. There’s going to be projects we do that have a deeper longer-lasting impact than a six week pop-up plaza. But the idea of having the six-week pop-up plaza shows that with very little investment that a group of partners, nonprofits, citizens, and government players can come in and really change a space and make it more interesting, more of an asset to the community, rather than just having this piece of asphalt sitting there contributing to the heat island effect. We really look forward to working with Blue Sky in the future around these types of spaces, especially what we could do with technology. We’d also like to do some analyses along the branches of the Beargrass Creek in upcoming years. Where can we find vacant asphalt lots where we could go in and go a depaving project and completely return that site back to the stream and mitigate the stormwater runoff in the area. But let’s not do just one depave, let’s get a coordinated plan along all the branches of the Beargrass.